“I felt dizzy and my right side started feeling very strange,” Audrey said. Unable to keep her balance, she finally stood up long enough to walk out of the office. A co-worker asked her a question, but Audrey couldn’t speak. The university’s police department called 911 and the paramedics realized Audrey was having a stroke. 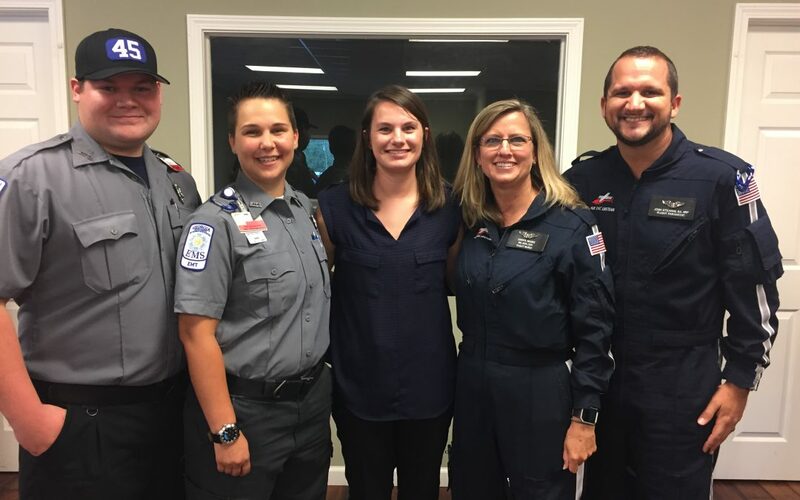 The paramedics took her to Tanner Health System in Carrollton, where pilot Chris Posey, flight nurse Cheryl Moore and flight paramedic Josh Stearns were ready and waiting. “They flew me straight to Grady and the stroke team met me there,” Audrey said. It was 45 minutes from the 911 call to the Marcus Stroke and Neuroscience Center at Grady in Atlanta. Cheryl remembered seeing Audrey for the first time, as the medical crew prepared to fly her to Grady. The first neurologist who saw Audrey post-surgery agreed. What are the first signs of a stroke? The American Stroke Association wants you to be able to spot the signs F.A.S.T. F – Facial Drooping. Does one side of the face droop, or is it numb? Ask the person to smile. Is the smile uneven? S – Speech Difficulty. Is speech slurred? Is the person unable to speak or hard to understand? Ask the person to repeat a simple sentence like, “The sky is blue.” Is the sentence repeated correctly? T – Time to call 911. If someone shows any of the above symptoms, even if the symptoms go away, call 9-1-1 and get the person to the hospital immediately. Check the time so you’ll know when the first symptoms appeared.